Conducting and facilitating virtual meetings. First, this video will give you a giggle if you’ve attended many virtual meetings… but don’t forget to read on afterwards..! At this stage in the evolution of business technology, virtual meetings are an integral part of the day-to-day activities of a huge number of Organisations and work forces. Many Organisations would simply not be able to continue to exist (or would need to adapt radically) if virtual meetings were no longer possible. 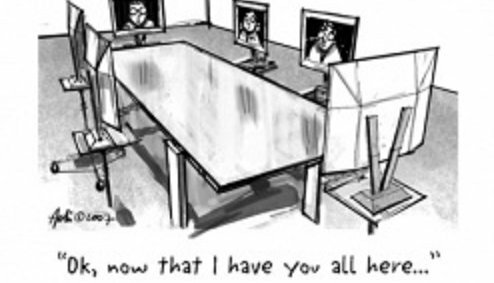 At least the technology (whether video or voice-only) is better than it was way back when multi-location meetings started to become common. I agree that they are not as easy in some ways as face-to-face meetings when it comes to the non-verbal stuff like body language, attempts to contribute, noticing lack of participation etc. However, virtual meetings can also be better, especially when they involve remote / offshore participants.